We've been trying to eat healthier but it's sometimes hard when you're a family of snackers. Most prepackaged, convenient treats aren't particularly good for you. Especially those puffy, cheesy things that leave orange residue on everything. You know what I'm talking about. I love cheesy poofs but they're pretty much totally devoid of any nutritional value so I hate feeding them to my kids. As I've mentioned before, there is a snack that manages to satisfy crunchy, poofy cravings without ruining your diet: Pirate's Booty. And they've introduced a brand new flavor to their already stellar line-up: New York Pizza. Full of Italian spices and mozzarella cheese, you can snarf down a whole bag of these for only 120 calories and half a gram of saturated fat. That's about as close to a guilt-free munchfest as I can think of, plus you get 2 grams of protein in there, too. So, really, you're eating healthy… or at least, healthier. If your kids like printables, check out the Pirate's Booty downloads! 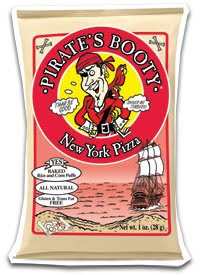 Disclosure: I received several bags of New York Pizza Pirate's Booty in a super cute pizza delivery box that I can't believe I didn't photograph. Adorable. Pirate Booty=heaven. I'm partial to the Veggie Booty, though I haven't bought any in quite some time. This flavor sounds yummy too. I'm a "booty" addict and cannot wait to try out this new flavor! YUM! Oooh sounds so good! I saw some Pirate Booty at Costco last weekend. I should have gotten some! Dangit. Uh oh. Pizza flavor? Why do I have a feeling I won't be able to find these nearby? I guess because I want them.